Listen In Circles, Droid Shots, Minneapolis, Minnesota, December 2014, photos © 2014 by QuoinMonkey. All rights reserved. I am reading a book of essays that Gail gave me on the different ways that artists make a living. Their studios, how they obtain money, do they have day jobs. It’s good to read because it reminds me of all the ways that artists and writers make their art and writing work with the rest of their lives. It’s humbling. And it teaches me not to give up. I’ve been experimenting with doing nothing really, nothing but practice. I keep up my haiku practice. I do some writing practice but not every day. I do no specific art, no photography, no writing. I want to see how it makes me feel inside to give these things up. It’s a long break, a hiatus from identifying as an artist. It’s good to take a break sometimes. What I am noticing is that it relieves a lot of pressure. Pressure to be something else, to be doing something else besides living day to day. It does relieve pressure. But it hasn’t brought me peace. I look to another day, a small room of my own. Maybe that’s dreaming an unrealistic dream. I don’t know. All I have is this moment. This one moment. In this moment, I end a writing practice and move on. When I feel lost, I go back to what I know. Back to my practices. Back to Beginner’s Mind. I am rereading Everyday Sacred by Sue Bender. 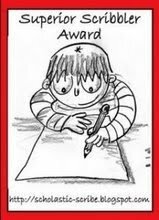 She writes and sketches her journey with the begging bowl. 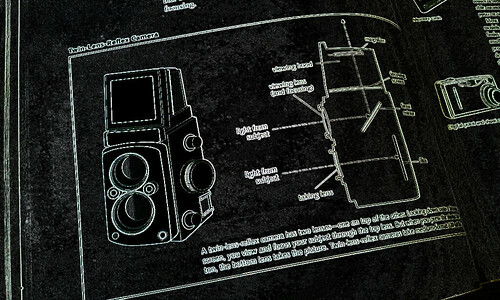 The image of the bowl became the image of the book. The empty bowl, waiting to be filled. 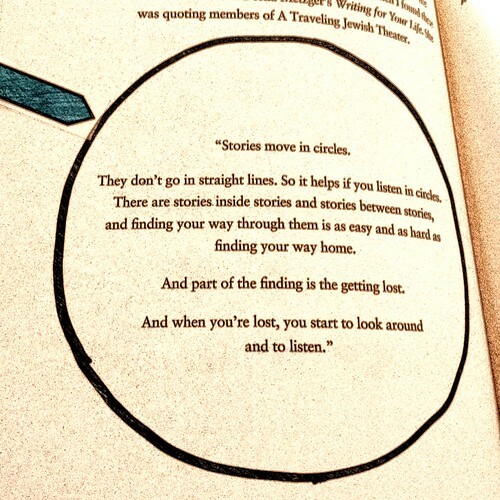 Stories move in circles. They don’t go in straight lines. So it helps if you listen in circles. There are stories inside stories and stories between stories, and finding your way through them is as easy and as hard as finding your way home. And part of the finding is the getting lost. And when you’re lost, you start to look around and to listen. 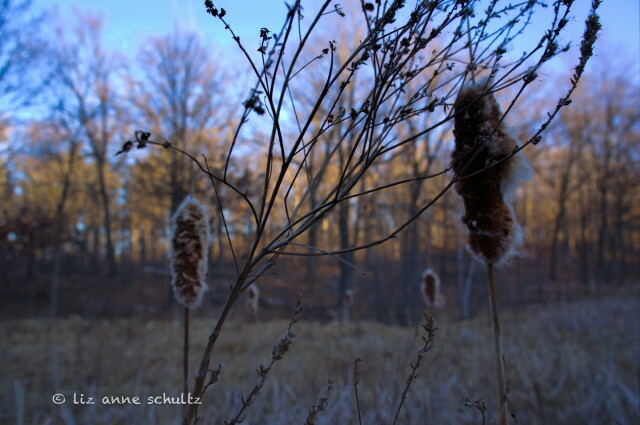 Cattail Bog, Sony NEX Shots, Minneapolis, Minnesota, February 2012, photo © 2013 by Liz Anne Schultz. All rights reserved. When you live in a land of lakes, you tend to develop an intimate relationship with wetland geography. Liz passes Theodore Wirth Park on her journey to and from work and sometimes stops to take photographs of one of its hidden gems—the Quaking Bog. The park’s Quaking Bog is a five-acre acid bog where nearly 200 mature tamaracks shade the understory sphagnum moss. Bogs (also known as mires, quagmires, muskegs, and fens) are remnants of the last glacial age. They each develop differently, depending on climate and typography, and often occur when the water at the ground surface is acidic and low in nutrients. 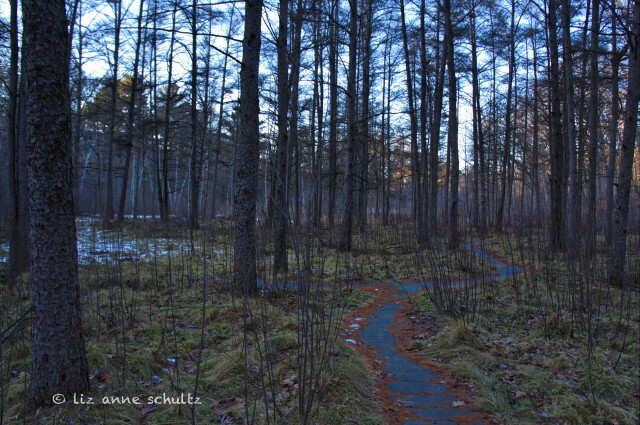 QuoinBog Path, Sony NEX Shots, Minneapolis, Minnesota, February 2012, photo © 2013 by Liz Anne Schultz. All rights reserved. The quaking bog is one of the most novel features of forests of the northern United States, especially those in New England and Wisconsin. It’s an area of sphagnum moss, rushes, sedges, and decaying vegetation, the whole mass of which is floating on a pool of water. The surface appears solid and stable, until trusted with the weight of a step. What seems to be firm ground then shivers, sinks, and rises, like a natural trampoline or waterbed. If the first shimmy of this rich root mass underfoot is not heeded, one might easily break through the entangled mat into water and loose mud below, as if one had stepped into quicksand. The quaking bog suggests in perceptible human time the larger ripple, rise and fall, and shifting of the Earth’s surface in geologic time. 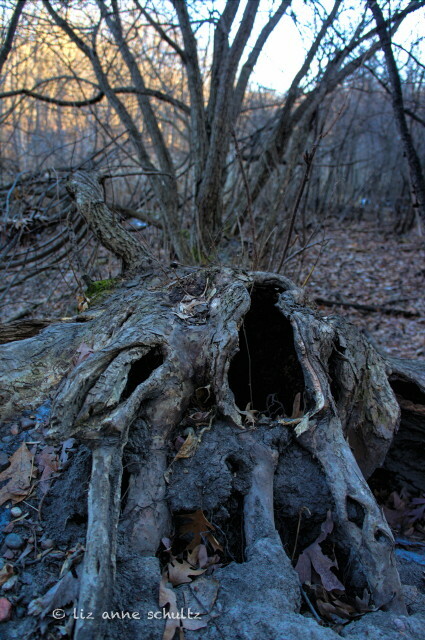 Quaking Bog Tree, Sony NEX Shots, Minneapolis, Minnesota, February 2012, photo © 2013 by Liz Anne Schultz. All rights reserved. Video – What Is A Quaking Bog? -related to posts: Standing Your Ground —-Arroyo, Gulch, Gully & Wash, Midwest Poets & Writers — When Can You Call A Place Home? See The World Without Going Anywhere – 88/365, Archive 365, BlackBerry Shots, May 2010, Philadelphia, Pennsylvania, photo © 2010-2012 by QuoinMonkey. All rights reserved. 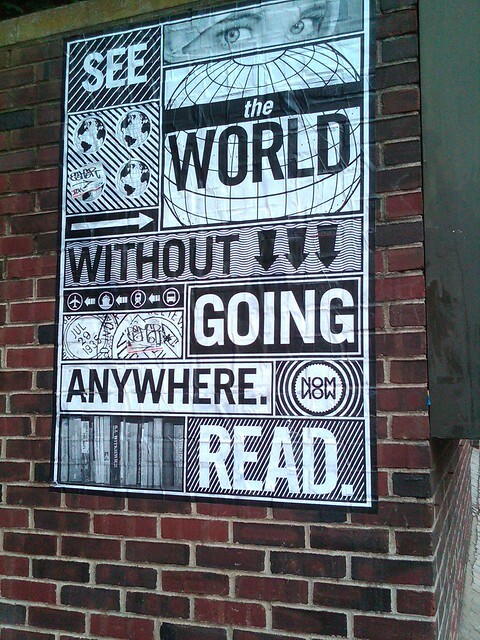 Seen on a walk through Philadelphia, Pennsylvania in 2010. The things that are important are sometimes invisible to the eye. 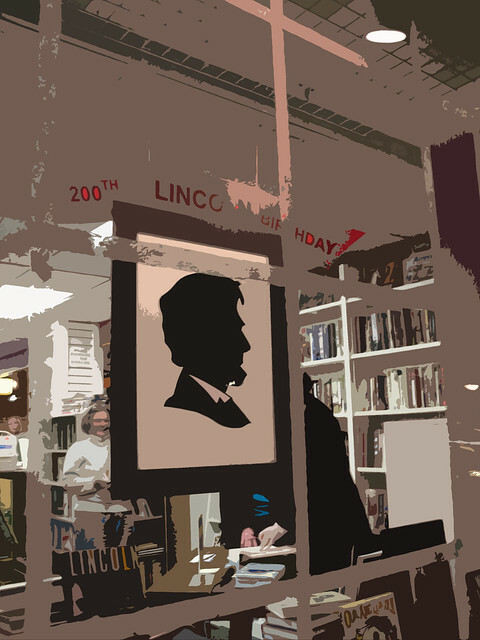 Like the images that develop in the mind and heart when we read. ARCHIVE 365: Archive 365 is a photo collaboration between skywire7 and QuoinMonkey featuring images from our archives. We will alternate posting once a day in our Flickr sets from July 1st 2012 through June 30th 2013. You can view our photographs at skywire7 Archive 365 set on Flickr and QuoinMonkey Archive 365 set on Flickr. There aren’t many things more satisfying than the combination of music, literature, philosophy, and art. 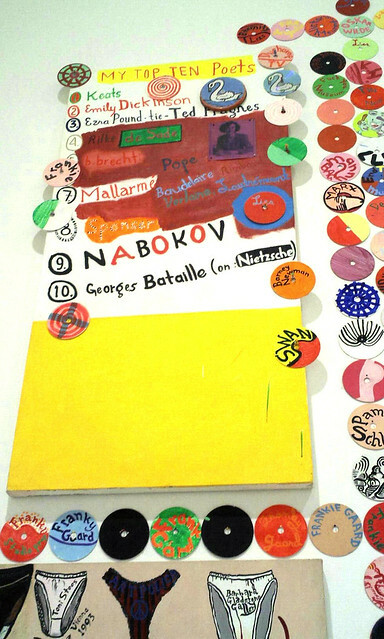 In January we attended opening weekend of Frank Gaard: Poison & Candy, a 40-year retrospective at Walker Art Center. The work is a visual feast. Layers of eye-popping color on canvas, vinyl, and CD fuse the past to the present with timeless themes that stretch far into the future. By the time I arrived at the Minneapolis College of Art and Design (MCAD), Frank Gaard had been teaching there for 17 years and was a legend. From 1974 to 1994 Gaard was the mastermind behind Artpolice, an underground ‘zine about art, war, politics and life. The Walker show features over 50 works including portraits, illustrations, and sketchbooks (he has kept a dairy all his life) and runs through May 6th. After attending the opening, I could not pass up the opportunity to hear Frank speak. Gaard On Gaard, his gallery talk on February 9th, woke me up. I’d like to listen to it again and write a longer piece. When you hear lifelong artists speak about their lives, you learn things about the craft that can’t be taught in books. The artist in me came away inspired by the strength of his voice; he was fearless. The writer loved the way he incorporated his love of writing, philosophy, and music into his art. My favorite paintings include his walls of portraits and his lists. Which of his poets would be at the top of your list? Frank Gaard Portraits, Droid Shots, Minneapolis, Minnesota, January 2012, photos © 2012 by QuoinMonkey. All rights reserved.